The previous night Jamaica's Warren Elliott, Jomo Pitterson and Shane Matthews were discussing their strategy to The Chess Drum's Daaim Shabazz and Sweden's Pontus Carlsson. It was apparent that Finland's powerful lineup would lend an advantage, but the men from the "land of wood and water" would have hoped the Finns had indulged in their affinity for vodka the previous night! On a serious side, the Jamaicans went in with confidence and nearly pulled off an upset. 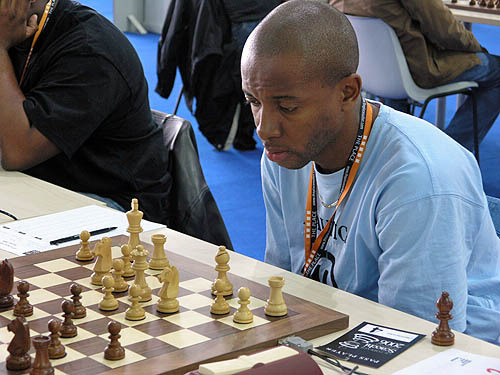 In Jamaica-Finland, seven-time national champion Shane Matthews was locked in a tense battle with Grandmaster Tomi Nybäck and reached a critical position. In the position on the right, Nybäck apparently picked up the piece, dangled it over the f4-square as if to play 47.Kf4?? Quickly seeing that the b-pawn runs, Nybäck placed the piece back on the original square and plays 47.Bc3. Matthews raced to tell the arbiter who was away from the board. When the arbiter inquired, Nybäck claimed that he indeed touched the piece, but stated that he was "adjusting" it. The arbiter ruled in Nybäck's favor after which Matthews adamantly protested. The arbiter's decision held and Matthews resigned immediately and stormed from the playing hall in total disgust. Jamaican officials were incensed at the ruling and plan to lodge a formal complaint. Former World Champion Garry Kasparov was also accused of the same infraction in a famous game against Judit Polgar. He went on to win the game. 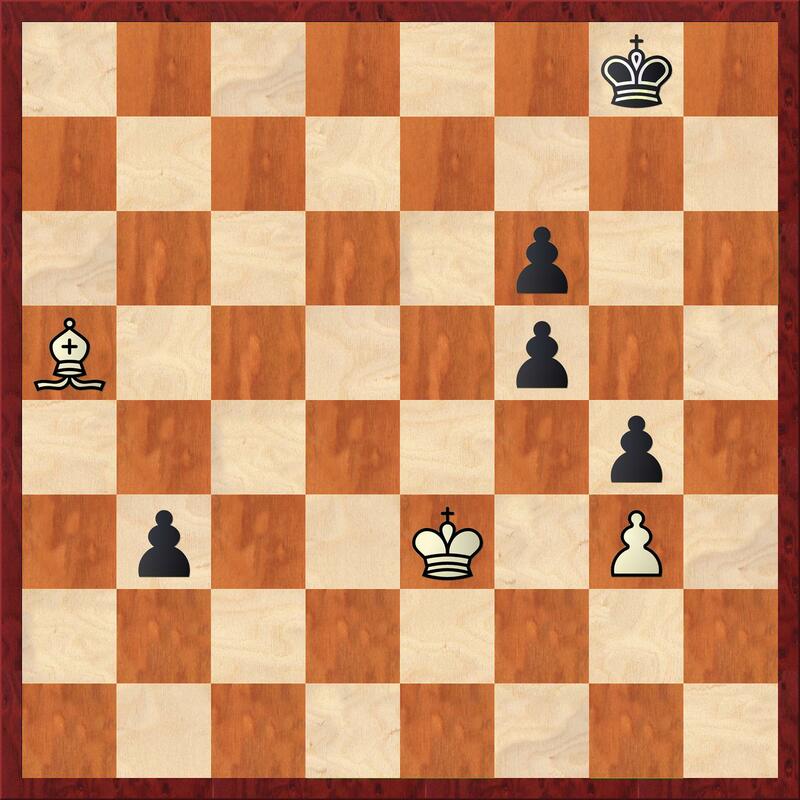 In Nybäck-Matthews, white was in time pressure and apparently attempted to play 47.Kf4 which would lose immediately to 47…b2. After realizing this, he placed the piece back on e3, then played 47.Bc3. Matthews protested, but the arbiter upheld the ruling that Nyback was "adjusting" the piece. Matthews resigned immediately and left the hall in disgust. Exciting chess today as this is becoming a tournament of improbable results. Russia still won, but this time they faced a tough German squad and eked out a 2½-1½ victory. Vladimir Kramnik seeing his first action, neatly dispatched of Arkadij Naiditsch who appeared to blunder a pawn after 13…O-O. Kramnik pounced with 14.Nxg7! and gained converted the point rather easily. Alexander Graf ground down Rublevsky in a textbook ending, but Evgeny Bareev's victory would provide the winning margin. The Ukraine won 3-1 over Serbia-Montenegro after Vassily Ivanchuk won a thriller in time pressure as the crowd saw the two banging the clock for a dozen moves. China has slowly moved into the lead with a convincing victory over Slovakia. Veteran Lubomir Ftacnik held Bu Xianzhi, but could not hold the young dragons on the remaining three boards. Wang Yue played a speculative queen sacrifice on move 13 and his pieces proceeded to rule the board. He ended the game with a beautiful mating attack. Israel was held by Peru after both Ilya Smirin and Emil Sutovsky were brutally crushed by IM Emilio Cordova and FM Marco Pacheco, respectively. Armenia kept pace with a 3-1 victory over Denmark. 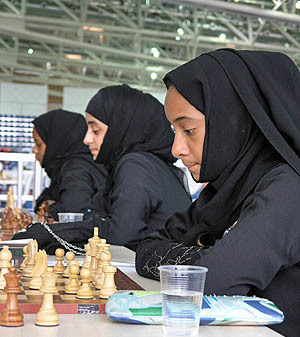 (L-R) Salama Al-Khelaifi, Safar Alshaymaa, Aisha Al-Khelaifi. Photo by Daaim Shabazz.